The first semester of Crew Mentors, NYC Outward Bound School’s peer-to-peer college mentoring program, ended last month and mentors Jharol and Laiba are getting ready for the spring semester. (Read about the early months of the program here.) Like any good startup (the program started in September), Crew Mentors “pivoted;” that is, Jharol and Laiba have adjusted their original program plan to better reflect the needs of their “clients,” in this case, the freshman students they work with. They came up with some important takeaways in the first semester that will help them reach even more students this spring. Takeaway Number One: High schoolers need to know about Crew Mentors before they graduate high school and start college. 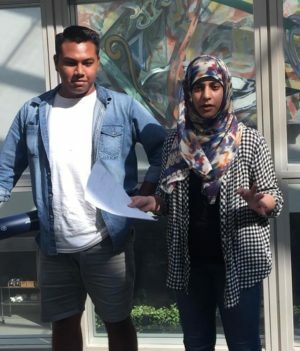 “What we learned in the last couple of months is that recruitment [and raising the program’s visibility] is going to be essential for next year,” Both Jharol and Laiba had trouble initially connecting with students in September. Although they had contact information for a targeted group of recent NYC Outward Bound Schools high school graduates, very few students responded to their initial outreach; only students who already knew about Crew Mentors were likely to engage. Jharol and Laiba are already making plans to visit all eight NYC Outward Bound high schools to promote Crew Mentors to current high school seniors. Takeaway Number Two: It’s not always what you say, but how you say it. Jharol and Laiba use a text messaging service to reach their students. Because of the service’s character limit, “we had to be straight to the point. We couldn’t really sound like a normal person,” said Jharol. Students didn’t appreciate the terse messages; in fact, one student finally told Jharol: “I thought you were a robot!” The Crew Mentors adjusted their strategy: now they use the texts to send very friendly notes to set up a phone call. Once they have a student on the phone they build rapport and can provide the important information the student needs. Takeaway Number Three: You can bring a horse to water, but you can’t make it drink. For both Laiba and Jharol, another big lesson this semester was learning to live with the fact that some of their mentees just aren’t going to take their advice or accept their help. “A few of them ask for help, then back away. It [made] me feel like I didn’t do my job,” Laiba said. But she’s learned to accept that it’s her job to provide resources, alternatives, guidance, and mentorship to their mentees. Sometimes the students will take their advice, sometimes they will find a good alternative on their own, and sometimes they will make a poor decision. Jharol and Laiba are committed to helping students who fall in any of those three categories. Final Takeaway: Students want college support, not social support. This fall, Jharol and Laiba threw a “social” for their mentees, thinking that they would be excited to meet and connect with each other. When only a few of their students showed up, they contacted the rest of their mentees, and Jharol asked them “Do you want us to emphasize socializing? Or do [you prefer we focus on] workshops, like financial aid workshops?” Overwhelmingly, their students reported that they were much more interested in the workshops, and didn’t feel like they needed help with socializing at college. Jharol and Laiba took note, and are creating more workshops for their students this spring rather than unwanted social events. The Crew Mentors are looking forward to this new semester. Jharol and Laiba both learned so much from their students, including how to pivot to better meet their mentees’ needs. We couldn’t be luckier to have Jharol and Laiba supporting students this year as College Mentors. Crew Mentors is the newest addition to the suite of supports we provide to students as part of our To & Through College program. Read more about the Crew Mentors pilot.